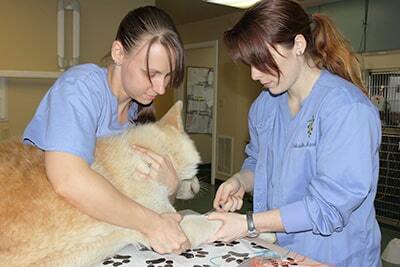 Our licensed veterinary technicians have either a two or four year college degree in veterinary technology. They must pass state board testing before receiving their licenses. We are proud of our “animal nurses” and couldn’t do our work without them. The veterinary technicians act as the veterinarian’s prep nurse before surgery and as their surgical assistant during surgical procedures. They help with anesthesia, and help to monitor your pet’s heart rate, pulse and breathing during procedures – making sure your pet is as safe as possible. Veterinary technicians perform tests on blood work in our in-house laboratory, for quick and accurate results. They serve as radiography and dental technicians as well. We rely on our veterinary technicians to work directly with you and your pets, gathering critical health information, providing you with education on pet health topics, and by taking diagnostic vitals before your pet sees the veterinarian. Our “animal nurses” do such important work and we are thankful for them. GABBY grew up in a small town in northern New York. Her love for animals began at an early age. She grew up on a dairy farm and loves everything from the cow to the chicken and even the mice. She graduated from SUNY Canton in 2011 as a licensed veterinary technician. Since then she has worked with doctors in holistic medicine, exotic (including zoo and wildlife animals), ER and specialty. She moved to Charlottesville Virginia in May 2015 to escape the cold and snow of New York and to explore the mountains of Virginia. She has had the pleasure of working at Old Dominion since September 2015. On her off time you will find her around town with her boyfriend, 2 dogs (Bella and Gaiah), and three cats (Meemers, Erie and Asher) or exploring the Blue Ridge. MEG has a long history of working for Old Dominion Animal Hospital. She came to work here while attending The University of Virginia, moved away briefly after graduation, but has been back part-time ever since. She is a great help to us, as she knows all our hospital’s positions. You might find her answering phones, admitting or discharging patients, running lab work, or assisting the veterinarians during an office visit. Her career keeps her busy, but she still finds time to come help out with the animals. When not working, Meg is an avid gardener and enjoys growing flowers and vegetables. JEN has been working in the veterinary field since 2014, and is currently working on getting her license as a veterinary technician. She grew up in Bangkok, Thailand, and has since lived in Massachusetts, New York, and Florida. She and her husband, David, moved to Charlottesville in 2017 with their two rescued pitbulls, Malcolm and Drogo, and they are so happy to have made this area their home. Jen is passionate about animal rescue, big dogs, and end-of-life care. EMILY grew up in Central Virginia. She is the baby of 5 kids. She has two brothers and two sisters. She has always loved animals and has had a wide variety of pets and breeds of dogs. She has wanted to work with animals since she can remember. In high school she was a member of the FFA for 4 years. She graduated from William Monroe high school in May 2018. She then began her career in the veterinarian field in August 2018. She hopes to further her career by attending vet tech school in the future. She has a variety of pets of her own and hopes to one day have her very own farm and rescue center. KELLY has recently joined our staff as a veterinary assistant. Please check back soon to learn more!